First, let’s look at our context. Earth is undergoing a profound transformation. A planetary shift in consciousness is underway, from the ego-based consciousness of separateness—with its tribalism, nationalism, and exploitation—to the consciousness of global oneness. We are headed into territory we have never seen before, and fear, an instinct designed to keep us safe, arises any time we move toward the unknown. 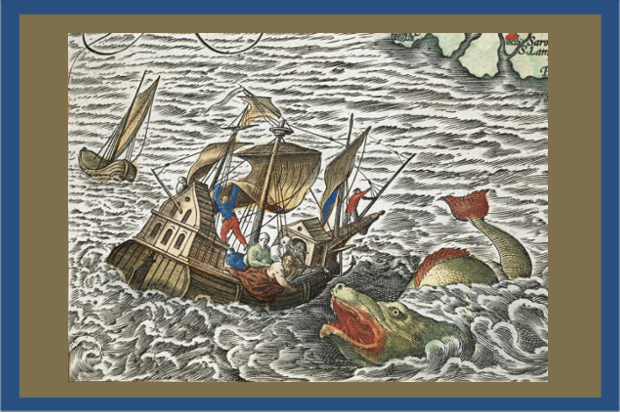 Think of those ancient maps that depicted dragons in uncharted regions of the ocean, warning seafarers about the dangers of venturing into the unknown. We are presently setting out across those dragon-filled waters because something in us knows that the world we have built, founded on the ego’s story of separateness, has no future. We are beginning to leave our familiar shores to set sail across an uncharted sea toward the species we will become. We don’t know who we will be, or what the world will look like, or even if we will exist in the same way we always have. Is it any wonder we are terrified? One of the most important things any of us can do to help make this perilous passage shorter and gentler is learning how to meet our fear in new ways. We know what our instinctual responses are: fight, flight or freeze. But there is a fourth response to fear that we are now being called to develop: face. Facing fear is a spiritual practice which cultivates mindfulness and increases our capacity to live as awakened, liberated beings. The dragons, no longer our enemies, become escorts showing us safe passage through this uncharted ocean. Here are four suggestions as you engage the spiritual practice of facing fear. When you feel fear arising, take a moment to ask yourself: What part of me is feeling afraid? Imagine you are a loving parent seeking a frightened child who you know is trembling, alone, in a corner of your psyche somewhere. Go within and find that frightened child—not to judge it, or shame it, or silence it, or repress it—but simply to see it. To accept it. To sit with it. To hold its hand. To be tender and compassionate. Doing this, you allow that fearful part to soften and become less afraid. You also move into your more highly evolved mind, the mind that has the capacity to witness. Accessing that part of you—the Self—that is untouched by fear, you discover that, although you may be feeling fear, you are not that fear. The second practice you can use when fear starts to arise is to pay close attention to the physical sensations of fear. Imagine you are a scientist investigating the anatomy of fear. Notice what fear actually feels like. How would you describe it? Is it a tingling sensation? Does it feel electric? Does it makes you quiver? Does it feel like a knot in your stomach? Does it make your heart race, your hands go cold? If so, what does the quivering feel like? What does the racing heart feel like? Hold fear under a microscope and scrutinize its every nook and cranny. Doing this will not only cultivate your Self awareness—you will also begin to realize that fear is simply a sensation created by the mind. Occasionally fear arises in response to an immediate danger that needs to be addressed, but more often it is in response to a story the mind is generating, perhaps based on previous trauma. You can also begin to notice that, physiologically, fear expresses itself identically to another emotion: excitement. Recognizing this, you can begin to shift your relationship with fear. The more you are able to sit with and experience fear as a benign sensation, the more you will realize that FDR, well-intentioned though he was, got it wrong. Fear isn’t something to fear, or even defend against. It’s something to allow yourself to notice, to experience, to accompany. The third practice moves you beyond mindfulness into liberation by lifting you out of the mindset that generates fear in the first place: bless the source of your fear. If Donald Trump is that source, bless him in his divine radiance, which, although it may be hidden, is completely present. You may find the idea of this practice offensive at first, but I encourage you to just try it and see what happens. What you will discover is that it isn’t possible to fear someone and bless them at the same time, because fear and blessing arise from two different states of consciousness. Fear arises from the ego that believes you and your adversary are separate and that death is real. Blessing arises from the infinite Self that knows better. By activating the power of blessing, you free yourself from the illusion of separateness and allow yourself to abide in the Reality of Love. The final practice I’d like to offer you is to instigate loving action in the face of fear. This is where you begin to embody and enact the truth of oneness, and in doing so you help heal and liberate those who are consumed by hatred and imprisoned in the illusion of divisions. When you engage in loving action, you become more than a mere character acting out the dictates of the ego’s script of hostility; you become the author of your story—a co-creator who is helping bring forth the future of peace we are all seeking. You see, we have not set out across these turbulent waters because there is a new world to be discovered. We have set out across these waters to discover who we are—beings capable of realizing our oneness with all that is, co-creators of a new world in which All flourish as One. Fear, or any feeling, is just a product of thought. We live in the feelings of our thoughts and therefore, I thank, whatever feeling shows up, they are usually the first indication as to the quality of my thinking. I am so grateful that I have some understanding of the relationship or the package deal of Mind, Thought and Consciousness to create my moment to moment experience from the inside out. It is just the meaning I give, via my creative ability to think, that give meaning to any circumstance, person, or situation. It is that sense of oneness that connects us all that brings me to a quieter mind. This living life is such an incredible journey!! !